Few vehicles out there are as immensely satisfying than the Porsche Cayenne Turbo. It angers snooty purists who hate that it exists, it’s fast and it can tow most other Porsches. 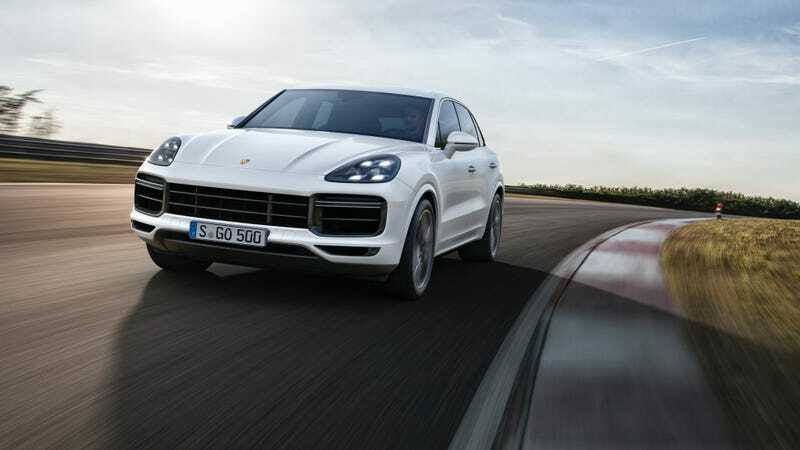 The new 2019 Cayenne Turbo is quicker than ever, with a claimed 550 horsepower and 567 lb-ft of torque, complete with active aerodynamics and a top speed of 177 mph. All that power—good for a modest bump of 30 hp and 14 lb-ft of torque over the last Cayenne Turbo—comes from a new twin-turbo four-liter V8 that has the turbos cleverly packaged inside the V of the cylinders of the engine. Porsche says that shortening the exhaust paths into the turbochargers on this engine made the engine more responsive and improved power delivery. Furthermore, this more compact central-turbo layout allowed them to package the engine lower in the chassis for a lower center of gravity that improves the truck’s handling. Like all Cayennes before it, Porsche’s goal was to make it feel like a sports car to drive. Rear-axle steering and the Porsche Torque Vectoring Plus systems were also added to help keep the big truck under control. The Cayenne Turbo also gets an adaptive rear roof spoiler that optimizes itself for rear downforce on acceleration and acts as a big air brake when slowing down, shortening the Cayenne Turbo’s braking distances. (Yes, on a truck.) The Cayenne Turbo gets high-performance tungsten-coated brakes standard, with the track-ready Porsche Ceramic Composite Brake system available as a wholly ridiculous upgrade. A new eight-speed Tiptronic S automatic transmission feeds that power into the Cayenne Turbo’s wheels. The Porsche Traction Management all-wheel-drive system makes sure all the wheels are putting that power to the ground as efficiently as possible. It’s all riding upon the new lighter Cayenne chassis for 2019, and features staggered front and rear wheels and a 48-volt electrical system just like the rest of the range. Its three-chamber air suspension has six selectable height levels and five new drive modes (On-Road, Mud, Gravel, Sand, or Rocks). Chassis settings and differential locks are also controllable to run through whatever kind of terrain you please. The end result is that the new Cayenne Turbo is even faster than the previous Cayenne Turbo S despite having less torque and power than that model. The new Cayenne Turbo goes from 0 to 60 mph in just 3.7 seconds with the optional Sport Chrono Package—a full 0.1 seconds faster than the outgoing range-topping Turbo S.
Inside, the Cayenne’s new 12.3-inch Porsche Advanced Cockpit high-definition screen and two seven-inch screens to both sides of an analog tachometer help you control the Cayenne Turbo’s features and functions, including the standard 710-watt Bose sound system and 18-way front sport seats. All of the Cayenne Turbo’s outboard seats are heated, along with the steering wheel. The Cayenne Turbo also gets a Turbo-specific set of double-row LED lights up front, wider wheel arches, 21-inch Turbo-specific wheels and twin tailpipes that will immediately identify it to fellow Cayenne fetishists and likely no one else. To the rest of the world, you’re in a big beefy soccer mom-mobile, and not a threat. The ultimate quick Porsche that no one ever, ever expects to be fast comes in with an MSRP of $124,600, and you can start placing orders for one in December 2017. That’s a nice condo in many parts of the U.S., but that’s looking at it all wrong. You can’t tow another Porsche with a condo. UPDATE [1:17 p.m.]: In case you’re curious about how the active aero works on the Cayenne Turbo, you can see its little spoiler pop up around 56 seconds into the launch video.